Mathematics has a language all its own – a rich tapestry of systems interconnected with ironclad logic. Linguistics, philosophy, and mathematics have shared insights for centuries – Sir Isaac Newton, for example, composed a hefty treatise in 1687 entitled Mathematical Principles of Natural Philosophy. Unfortunately, for most of us, high school algebra makes up the extent of our acquaintance with this field, and even that basic knowledge often eludes us. Below is a small refresher on three mathematical terms that can be useful in describing events and ideas found in everyday life. 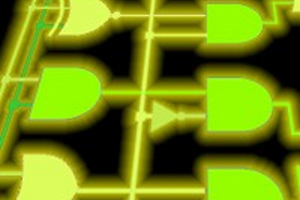 Named after 19th century English mathematician George Boole, a Boolean system is one whose parts are labeled as binary opposites – either true or false – instead of implicating a host of variables. Boolean algebra proved critical to the field of computer science, where it is utilized in a number of programming languages. The term may be used metaphorically in everyday speech to characterize a situation with only two possible but diametrically opposed conclusions. 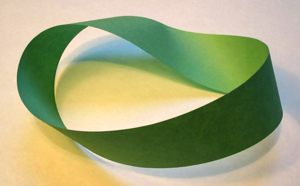 Named after 19th century German mathematician August Ferdinand Möbius, a Mobius strip can be modeled by slightly twisting a band of paper and connecting the ends. By tracing the loop that is formed from edge to edge, one starts on one side of the strip and finishes on the other. Conceptually, this phenomenon is akin to a “strange loop” – a paradoxical image explored by artists like M.C. Escher. In a strange loop, vertical levels are linked in such a way that it becomes impossible to distinguish the highest level from the lowest, and by going up one eventually finds oneself at the beginning. Naturally, this notion has been adopted by cognitive psychologists to refer to certain mental processes that involve circular causation. Beginning over 2,000 years ago with Euclid, mathematicians have explored this omnipresent occurrence. 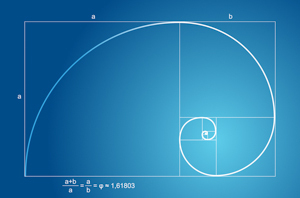 The golden ratio represents an ideal ratio of parts to the whole – a proportion found with striking frequency in the natural world. Mathematically, it is modeled as a + b / a = a / b, meaning that the sum of two quantities divided by the larger quantity is equal to the ratio of the larger quantity to the smaller one. In art, architecture, and music, creative minds have strived to recreate the proportions of the golden ratio so as to create the most aesthetically pleasing works. It is widely considered that the most beautiful human faces are ones that conform to the golden ratio.